(Phys.org)—A team of researchers with NASA, several other U.S. institutions and one from Vrije Universiteit Amsterdam has found that large increases in Indonesian fire activity and the resulting smoke pollution that occur some years can be linked to El Niño events. In their paper published in Proceedings of the National Academy of Sciences, the researchers describe their analysis of long-term satellite imagery, what it revealed and why they believe changes need to be made. Last year, fires in Indonesia drew headlines due to the massive amount of smoke generated and carried over long distances in the atmosphere. The fires were set by palm oil and other farmers in their fields as they sought to get rid of leftover debris—it is, according to the researchers, currently the most economic means for clearing fields. But the smoke is a form of pollution, irritating lungs and sending massive amounts of carbon dioxide into the air, adding to the amounts from other countries and contributing to global warming. But as the researchers also note, some fire years are much worse than others—2015, for example, was the worst since 1997—it was so bad the smoke cloud covered a small swath halfway around the equator. To gain a better understanding of why some years are worse than others, the researchers studied satellite data from five separate instruments going back to the early 2000s and compared what they found with meteorological data. 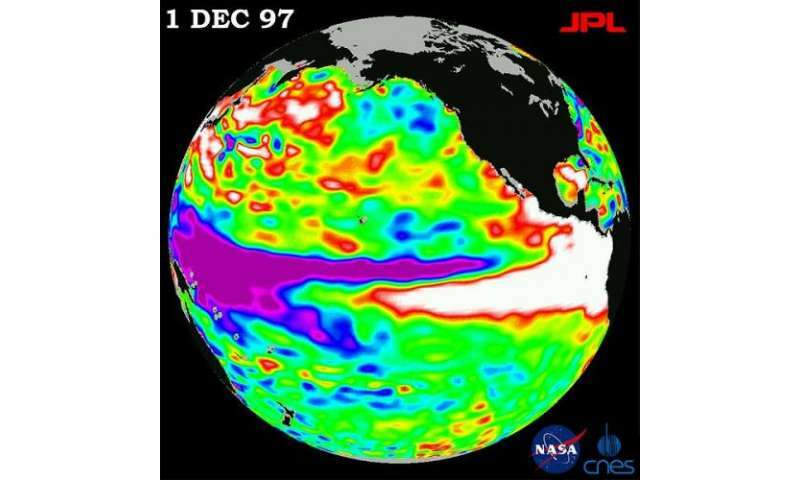 Data from both sources revealed a pattern—the worst fires happened during El Niño events. To understand why, they looked at the conditions on the ground during such events. They found that El Niño events led to very dry conditions in Indonesia—so dry that the peat under the fields the farmers burned would lose its moisture. Fires set to clear the land moved underground, igniting peat, which when burned, produces a lot of smoke. The researchers were even able to spot a tipping point—during times when there was less than 4 millimeters of average daily rain, the peat dried out, leading to extra-smoky fires. They conclude by suggesting that a means must be found to assist the farmers in clearing their fields during dry years that does not involve burning if the problem is to be averted during future El Niño events. The 2015 fire season and related smoke pollution in Indonesia was more severe than the major 2006 episode, making it the most severe season observed by the NASA Earth Observing System satellites that go back to the early 2000s, namely active fire detections from the Terra and Aqua Moderate Resolution Imaging Spectroradiometers (MODIS), MODIS aerosol optical depth, Terra Measurement of Pollution in the Troposphere (MOPITT) carbon monoxide (CO), Aqua Atmospheric Infrared Sounder (AIRS) CO, Aura Ozone Monitoring Instrument (OMI) aerosol index, and Aura Microwave Limb Sounder (MLS) CO. The MLS CO in the upper troposphere showed a plume of pollution stretching from East Africa to the western Pacific Ocean that persisted for 2 mo. Longer-term records of airport visibility in Sumatra and Kalimantan show that 2015 ranked after 1997 and alongside 1991 and 1994 as among the worst episodes on record. Analysis of yearly dry season rainfall from the Tropical Rainfall Measurement Mission (TRMM) and rain gauges shows that, due to the continued use of fire to clear and prepare land on degraded peat, the Indonesian fire environment continues to have nonlinear sensitivity to dry conditions during prolonged periods with less than 4 mm/d of precipitation, and this sensitivity appears to have increased over Kalimantan. Without significant reforms in land use and the adoption of early warning triggers tied to precipitation forecasts, these intense fire episodes will reoccur during future droughts, usually associated with El Niño events.